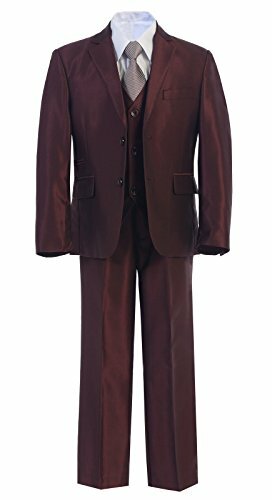 5-Piece Gorgeous Shiny Formal Boy's Suit includes Jacket, Pants, Vest, Shirt and Necktie. Single Breasted Jacket w/ Notch Lapel. Fully Lined. Soft Shoulder Pads. One Welted Pocket on Top-Right Chest, Two Welted Pockets on the Front. Two Covered Button. Matching Fully Lined Vest. Premium Quality Garment - 65% Polyester 35% Rayon. Pants with Elastic Band (sz. 2-7 ) / Adjustable Clip (sz. 8-20). If you have any questions about this product by Whispers, contact us by completing and submitting the form below. If you are looking for a specif part number, please include it with your message.